Recovering from a back injury, Sachin Tendulkar hit a sparkling half century but the Indian team got a sound thrashing from a second string Pakistan team for a nightmarish start to their historic tour before the high pressure one-day series beginning Saturday. Rahul Dravid hits a shot off the bowling of Pakistan's Umar Gull during a warm-up match between India and Pakistan 'A' in Lahore on Thursday. That cricket is one of the strongest bonding agents between India and Pakistan had become evident soon after the bloody partition of the subcontinent in 1947, and it took just five years for the two countries to start playing Test cricket with each other. Living up to his reputation of making betting allegations before every important cricket tournament, former Pakistan pace bowler Sarfaraz Nawaz cast doubts over the India-Pakistan series claiming that the underworld will hold sway over the series. South African spinner Paul Adams bowls in his unique action on the second day of the first Test against New Zealand at Westpac Park, Hamilton, on Thursday. Damien Martyn and Darren Lehmann joined Matthew Hayden with second-innings centuries as Australia pressed for victory in the first Test against Sri Lanka today. The touring side, 161 runs behind after the first innings, amassed 512 for eight in a remarkable comeback before declaring shortly before the close on the fourth day. 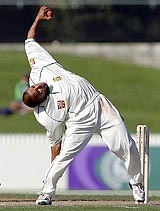 Sri Lanka needing 352 to win, ended on three without loss after leg spinner Shane Warne opened the bowling. Australia were dismissed for 220 in their first innings but opener Hayden transformed the game by attacking Sri Lanka’s slow bowlers on his way to an 18th Test century containing 12 fours and two sixes. He rode his luck as he added 24 runs to his overnight score before being caught at slip as he swept at an off-break from Muttiah Muralitharan. South Africa batsman Gary Kirsten cut loose to score a superb century and put the Proteas in a strong position against New Zealand at stumps on the second day of the first Test today. Holland had enough ammunition in their ranks to get past a fighting India 4-2 to enter the final of the pre-olympic hockey qualifying tournament today. India twice battled back to equalise in the match but the defensive errors were just too many at the back and the Dutch utilised those for a fine victory. For Holland, the scorers were, Taeke Taekema (13th, 34th), and Matthijs Brouwer (47th and 65th). India scored through Gagan Ajit Singh (30th minute) and Deepak Thakur (42nd). It is not all cricket here, though the media hype back home is deafening. The reason, this “historic” tour has cast a shadow over the SAF Games to be held in Islamabad from March 29. The Indian challenge at the All-England Open Badminton Championship came to a tame end with all the three Indian men bowing out in the second round at Birmingham. 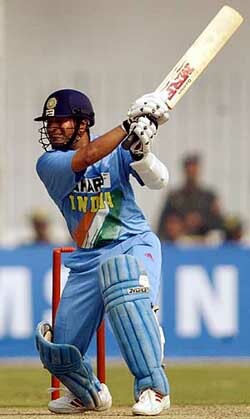 Sachin Tendulkar hits a shot during a warm-up match between India and Pakistan 'A' in Lahore on Thursday. 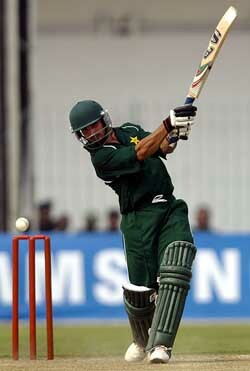 Pakistan's Imran Nazir hits a shot during a warm-up match between India and Pakistan 'A' in Lahore on Thursday. After the recent scare about his back problem, Sachin Tendulkar was in good form to hit a quick 76 against Pakistan ‘A’ in the first outing for the Indian cricketers in the Gaddafi Stadium. Vice-captain Rahul Dravid top scored with an unbeaten 92 while swashbuckling opening batsman Virender Sehwag hit 75 to propel India to 335 for six in the allotted 50 overs. But wayward bowling by Indian pacemen saw Pakistan ‘A’ overhaul the challenging target with six wickets in hand and four overs to spare. Spearheaded by a lucky Taufeeq Umar who scored a 89-ball 104 and a breezy 65 by Imran Nazir gave a solid foundation for the Pakistani youngsters with the Indian pace attack Zaheer Khan, Laxmipathy Balaji and Irfan Pathan failing to bowl a good line and length. The chinks in the Indian bowling armoury was thoroughly exposed as Umar and his opening partner Nazir tore the bowling attack to shreds on a perfect batting track to lay the platform for a remarkable victory for Pakistan ‘A’. Umar’s onslaught which contained 13 boundaries and two sixes and Nazir’s blitzkrieg completely defused the visitors. The sight of India’s frontline bowlers being clobbered all over the park would be a worrying factor for skipper Sourav Ganguly. Tendulkar, however, showed no signs of the stiff back which troubled him during the three-day camp in Kolkata and gave a controlled display of aggression during the Indian innings which was watched by a handful spectators. The crowd grew by a few hundreds when the home team batted in the afternoon. Nazir and Umar then launched a murderous assault on the new ball bowlers with Zaheer Khan and Lakshmipathy Balaji going for runs as the hosts managed a sensational run rate of more than 12 runs in the early stages of the proceedings. New pace sensation Irfan Pathan, who was a hero during the under-19 Asia Cup in Pakistan last year, conceded as many as 24 runs in his first over as Nazir picked him for special treatment. The Pakistan ‘A’ total had raced to 183 for one after 15 overs. The runs continued to come in torrents as left arm spinner Murali Kartik was spanked for 23 runs in his first overs as Umar blasted him for four consecutive boundaries while Nazir lifted the last ball for a towering six. The opening pair added a brisk 127 runs for the first wicket before Zaheer Khan sent Nazir’s middle stump flying as the batsman tried to glide the ball on the off-side. The home team managed to maintain a run rate of over 10 runs even after Nazir’s dismissal as Umar opened up with newman Nauman Ullah (35) being quite content to play second fiddle. The second-wicket pair stitched 93 runs before part-timer Sehwag provided the breakthrough by getting rid of Ullah with Kartik taking a well-judged catch at the deep. Umar’s belligerence ultimately came to an end when substitute wicketkeeper Parthiv Patel held on to a catch off Tendulkar much to the relief of the Indians who seemed to have no clue as to how to stop the runs. Bazid Khan, who joined the action after Umar’s dismissal, could not survive for long but Faisal Iqbal and Qaiser Abbas took the team to victory without much fuss. The Indian batsmen seemed to be in good touch as Tendulkar and Sehwag put on a scintillating 149-run opening partnership to provide the foundation for a huge Indian total which proved to be inadequate in the end. Sehwag was the more aggressive of the two openers as he launched the assault from the very first over bowled by an erratic Umar Gul who conceded as many as 34 runs in his first three overs. Tendulkar was quite content in allowing his partner to torment the Pakistanis before giving glimpses of his class with some majestic strokes. Spinner Qaiser Abbas provided the first breakthrough for the home team by evicting the dangerous Sehwag who went for a mighty cross-batted heave but failed to time the stroke and Bazid Khan held on to the catch at the mid-wicket region. The Delhi batsman struck 14 boundaries and a six during his 68-ball knock. Captain Sourav Ganguly (5) again fell prey to the short-pitched ball as he tried to fend off a flier from Umar Gul but only succeeded in offering a simple return catch to the bowler much to the delight of the home team. After Tendulkar also returned to the pavillion for a 82-ball 76 which was studded with 11 boundaries, Dravid took centrestage and unleashed some lusty hits in the slog overs. His 70-ball unbeaten 92 contained 13 boundaries and a six. Fall of wickets: 1/149, 2/172, 3/182, 4/239, 5/250, 6/329. As the match was being telecast live, the Pakistani senior team sitting in Karachi would have watched with great interest. The Indians had put what almost was an impregnable total on the board and then had the mortification of watching the bowlers getting skinned by scratch batsmen who snatched the game away from them with some audacious strokeplay. 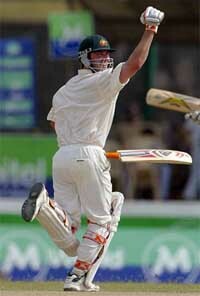 Wright admitted that the team had few problems, lack of discipline on the part of the bowlers being one. “When you are being attacked and the opposition is aggressive to you, you have to have a plan B. Our line was all over the place today and the bowlers have got to learn from that because we just can’t have people consistently, when under pressure, going for sixties and seventies plus. It is the one area of our game that needs to be sorted out,” he said. The coach also agreed when it was put to him that Inzamam-ul Haq and his men would have had an entertaining day before the television screens in Karachi. “I’m sure they watched with interest,” he said. As the Indian team landed in Lahore on Wednesday to start the historic tour of Pakistan, all I can gather is that each and every member is under tremendous pressure to dish out winning performance. Neither the 1996 World Cup played in India, nor the Pakistan’s visit to India in 1998-99 generated such attention and publicity. Apart from the normal cricketing gains, the active participation and interest taken by the governments of both the countries, the initial reluctance of the players to make the tour and their subsequent acceptance, the media interest, the excepted diplomatic gains of strengthening ties and the huge amount of money poured in by the sponsors – have all rolled into one to make this tour the mother of all series. It appears that the reception and the build-up the Indian team received during the momentous tour of South Africa in 1992, has been beaten fair and square by the current tour. India’s deputy in-charge Rahul Dravid admitted he had never experienced such a buzz of this sort in his career so far. Only Sachin Tendulkar can measure the intensity of this tour in comparison to the previous one in 1989 when he made his debut. Off course, apart from the usual cricketing performance of runs and wickets, it is the tone, tenor and the gestures of the players that will play a significant role in deciding the series. I am afraid that the use of verbal abuse will be rampant from the Pakistan camp, as their coach Javed Miandad has already initiated the process of physiological warfare. At the same time, I am pretty confident that the seniors in the Indian team are far too experienced in handling such things and have certainly pre-empted the younger lot to follow their footsteps. Little exchange of words is always good to give a boost to the challenging spirit of the game. But exhorting to indecent personal remarks and vulgar gestures will definitely not augur anything good to the so-called friendship series. Barring the incident in Toronto where the current Pakistan skipper Inzamam-ul-Haq strode into the crowd taking the law (read bat) in his own hands, his behaviour as a cricketer has always remained exemplary. A great timer of the ball, Inzy has always been a cool customer — be it in win or defeat. The rest of the Pakistani players cannot be put on the same pedestal. Behind the stumps, Moin Khan could be the real culprit. Wicketkeepers standing behind the stumps can be a menace to the game if they don’t conduct themselves properly. Stumpers’ proximity to the batsmen makes it is easier to exchange words. Shoaib Akthar has learnt his lessons from the World Cup encounter. His arrogant remarks only made our batsmen more determined to treat him disdainfully. Although Shoaib is careful with his words this time, the truth remains that he can’t really promise on his own conduct. The game is such a leveller that nobody can get away with show of arrogance. Even the real exponents of the game dread to make such conceited statements for the fear of curse of the game, which could be severe. The match referee is the all-important man in this series. Ranjan Madugalle, the former skipper of Sri Lanka, has huge responsibilities in conducting this series. Understanding the sensitive nature of this tour, Ranjan will have to set high disciplinary standards for both the sides. I am sure Ranjan realises that even a small incident on the field can spark exaggerated effects in both the countries where cricket is followed like religion. The Indian players have landed in Pakistan in the quest of winning the series. Both the teams are evenly poised, if not equally balanced. The teams will fight for honours of the team, the game and the country. But every member of the cricketing fraternity has the responsibility to propagate the game in the right manner. Players being unduly criticised for their commitment and courage, that, too, without proper insight of the game or with clear vested interest can cause havoc. We witnessed similar incidents during the last World Cup, where unreasonable comments from a section of the media put tremendous pressure on the players and their families. Once the cricket link was established, there was no dearth of high voltage, dramatic matches that have thrown up several world-renowned players who have etched their names in the annals of the game. Now the much-anticipated Test and one-day series is set to resume on Saturday at Karachi, when the first one-day international will be played at the National Stadium. India helped Pakistan get the membership of the Imperial Cricket Conference, as the International Cricket Council (ICC) was then called, in July 1952, and the same year the two nations played their first Test at Delhi’s historic Ferozeshah Kotla. Since then many memorable moments have marked the 47 Tests and 86 one-day internationals that the two cross-border rivals have played. Pakistan have the upper hand in these contests, though India have also scripted many a unforgettable triumphs. In one-day internationals, Pakistan have won 52 matches — many of them at Sharjah — as against India’s 30, while four have ended in no result. In Tests, Pakistan have won nine matches, while India have triumphed in just five, while 33 have ended in draws. Since India’s indomitable Lala Amarnath and Pakistani captain Abdul Hafeez Kardar, who had earlier played three Tests for undivided India, went out for the toss at the Kotla on October 16, 1952, the two teams have been involved in many close encounters. In the last four years, however, fans have been denied the nerve-wracking matches because of India’s decision not to play Pakistan following Islamabad’s support to cross-border terrorism. Last October, New Delhi announced the resumption of sporting ties with Pakistan and since then there has been much anticipation of the upcoming series. The news brought a big smile not only on the faces of cricket administrators of the two countries but countless fans in India and across the world. Like the first-ever Test in 1952, the last between the two teams was quite eventful, though for undesirable reasons — and in between there were some all-time great performances from them. If Indian all-rounder Vinoo Mankad bowled Pakistan to submission with figures of 13 for 131 in the Delhi Test of 1952, the last Test in February 1999 — the first match of the newly launched Asian Test Championship (ATC) — will be remembered for rowdy spectator behaviour at the Eden Gardens at Kolkata. An incensed crowd disrupted play after Sachin Tendulkar was declared run out for nine in a close decision in the second innings. The game restarted only after Tendulkar came out and pacified the spectators, but the middle order collapsed and India lost the match by 46 runs. Then the Kargil conflict erupted in 1999. The year brought the biggest bowling feat of all time, and it again happened at the Kotla on a cold and misty afternoon when Anil Kumble ran through the Pakistan second innings. The leg-spinner captured all 10 wickets for 74 in a legendary spell — only the second instance in the 126-year history of Test cricket besides Englishman Jim Laker’s feat — that sent the overflowing stadium into raptures and single-handedly won the match by 212 runs. The two-Test series was drawn 1-1 as Pakistan had won the first match at Chennai from the jaws of defeat. For moments such as these, many people believe that the India-Pakistan cricket rivalry is more intense than the England-Australia battles for the Ashes. Politicians realised this very early and tried to take political mileage out of these encounters — by disrupting them. 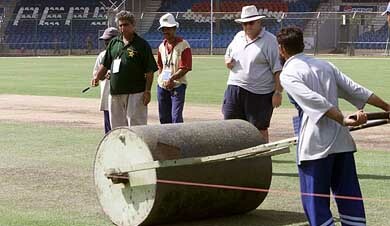 Shiv Sena activists dug up the Wankhede Stadium pitch in Mumbai, leading to the cancellation of a tour in 1990s. But they failed to prevent the Delhi Test — in which Kumble bagged all 10 — taking place when they repeated their act in 1999. After the first-ever series in 1952-53, the first long disruption came in 1960s and 1970s, when India-Pakistan wars suspended matches for almost 18 years. After Pakistan’s highly forgettable and boring tour of India in 1960-61 — all five Tests were drawn — the repercussions of wars meant that no Test was played for 17 years, eight months and eight days. When better sense prevailed and the Test series resumed with India’s tour to Pakistan in the winter of 1978, it was, by sheer co-incidence, again on October 16 that the first Test began at Faisalabad’s Iqbal Stadium! Legendary all-rounder Kapil Dev made his debut. He went on to capture 434 wickets — a former world record — in 131 Tests and 253 in 225 one-dayers. Mushtaq Mohammad’s Pakistan beat Bishan Singh Bedi’s Indian team 2-0 in the three-Test series and Pakistan promptly declared a national holiday. While politicians have hardly been a help to cricket, the game has always aided efforts to maintain peace, and none was more pronounced than the events in 1987 during Pakistan’s tour of India. Gen Zia’s meeting with Indian premier Rajiv Gandhi defused tension and the armies retreated soon after. Gen Zia was apparently a fan of the great Indian opener Sunil Gavaskar. When the Indian master played his 100th Test at Lahore on the 1984 tour of Pakistan, Zia presented him with an expensive carpet before the match. Gavaskar played his last of then world-record 125 Tests at Bangalore during that tension-filled series in 1987. He finished his career with a gritty 96 on a treacherous M. Chinnaswamy Stadium, but failed to prevent Pakistan from winning the fifth and final match by 16 runs — and the series 1-0. Although Gavaskar, Kapil and Bedi have since retired, players like Tendulkar and Pakistan’s Wasim Akram kept the rivalry going and continued to entertain the public as well. As the Indian team arrived in Lahore yesterday to begin its 40-day tour of Pakistan, Nawaz, known as the disgruntled boy of Pakistan cricket, alleged that mafia had set the stage to manipulate the results to its liking. In an interview to the local daily ‘The News’, Nawaz said his claims were based on the inclusion of the some of “non-performing” players in Pakistan team by the national cricket selectors. He said sacking of former cricketer Aamir Sohail as the Chief Selector ahead of the Indian series, inviting cricketers like Wasim Akram, whom he accuses of being involved in betting and match fixing, were some of the indications that led to him to conclude that betting may be in the offing. He alleged that there was already “interference” in coach Javed Miandad’s efforts to train the players. Referring to a recent lecture by Wasim Akram at the training camp in Lahore, Nawaz said if a player of the stature of Miandad was imparting training to the players, there was no need to invite players who had history of not getting along with him. * The Indian cricket team has been given special permission to fly out of Islamabad instead of Lahore after the completion of the high-profile tour on April 18. The team was earlier scheduled to fly out of Pakistan from Lahore on April 18 after playing the third and the final Test match at Rawalpindi but the civil aviation authorities have now granted the necessary permission to leave from Islamabad, a 30-minute drive from Rawalpindi. * The 20-year-old upmarket restaurant in the posh Gulbarg area of Lahore not only boasts of a rich variety of delicacies but has on its guest list a veritable who's who of dignitaries and celebrities. From the Pakistani fast bowler Shoaib Akhtar and all-rounder Azhar Mahmood to Indian Prime Minister Atal Bihari Vajpayee, all have eaten at this restaurant. "When Vajpayee saheb visited Pakistan a few years ago to meet then Prime Minister Nawaz Sharif he had dinner at our Salt 'N Pepper Village, one of the two branches of our restaurant," said Ajmal Kamal of the Liberty area branch of Salt 'N Pepper - a joint that caters for all kinds of tastes, from pizzas to traditional dishes. * The beautiful Gaddafi Stadium has named almost all enclosures after former players, most of whom have been national captains. The enclosures that catch the eye are the ones named after former captains Wasim Akram and Waqar Younis. But Waqar is the only exception in the 'retired players' category as he can at best be called "semi retired". * Is Aishwarya Rai coming? It seems there are as many fans here of Aishwarya Rai as there are cricket buffs. "Your team has arrived all right, but what I want to know is whether Aishwarya Rai is coming or not," said Irfan Ullah, manager of Salt 'N Pepper, with inquisitive eyes. "She is really beautiful. I know other Indian film stars are coming to watch some of the matches, but I am more interested in Aishwarya Rai." Damien Martyn and Darren Lehmann joined Matthew Hayden with second-innings centuries as Australia pressed for victory in the first Test against Sri Lanka today. The touring side, 161 runs behind after the first innings, amassed 512 for eight in a remarkable comeback before declaring shortly before the close on the fourth day. Sri Lanka needing 352 to win, ended on three without loss after leg spinner Shane Warne opened the bowling. Australia were dismissed for 220 in their first innings but opener Hayden transformed the game by attacking Sri Lanka’s slow bowlers on his way to an 18th Test century containing 12 fours and two sixes. He rode his luck as he added 24 runs to his overnight score before being caught at slip as he swept at an off-break from Muttiah Muralitharan. 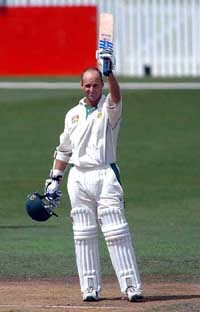 Martyn, his Test place under threat, then scored a patient 110, his first century for 25 months and the sixth of his career, and Lehmann plundered an aggressive 129, his fourth hundred in 16 tests. MELBOURNE: Uncapped young fast bowler Shaun Tait will replace the injured Brett Lee on Australia’s tour of Sri Lanka, Cricket Australia (CA) announced on Thursday. Fall of wickets: 1-51, 2-79, 3-211, 4-271, 5-281, 6-305, 7-364, 8-379, 9-415, 10-459. Bowling: Tuffy 26-11-62-0, Oram 27-7-76-2, Cairns 18-2-52-0, Vettori 39.2-2-158-4, Wiseman 12-1-54-0, Styris 16-4-46-2, McMillan 1-0-5-0. Holland did attack from the whistle but their midfield today seemed a bit off colour. The normal Dutch bite was missing in the attack but with their penalty corners coming good they dominated the first half. Holland took the lead in the 13th minute off their first penalty corner. Taeke Taekema’s flick went between Devesh Chauhan and Kanwalpreet Singh to warn the Indian’s to start playing clean hockey at the back. But the errors kept coming. The Dutch attacked and it were their own errors in relaying the ball that didn’t let them build on the 1-0 lead. India did have a few sharp chances but could not capitalise on them. India finally equalised in the 30th minute when a rare defensive error from the Dutch saw the ball with Gagan Ajit Singh who stepped into the circle and sent a flyer past the Dutch goalkeeper. “The SAF Games are a biggest sporting events (Olympic disciplines) of this sub-continent, over 2000 athletes from eight countries are taking part and look there is hardly any talk about the games in the media here,” said a visibly annoyed official of Pakistan Olympic Association (POA). The official did not want to be named as the election for the post of POA president is scheduled to be held here today. The Games may lack glamour but like this cricket tour they are also historic in many respects, the official told UNI. “This is the first time in the history of Pakistan sports that women swimmers of the country will be taking part in any international competition. We are fielding a women swimming team in these Games. This is also for the first time that Afghanistan will be taking part in the Games. These two factors make the Games more important than the cricket tour,” he asserted. “For a country like ours (Pakistan) which is trying to shed its image of a fundamentalist state, the fact that women swimmers will be taking part in the Games should have been highlighted more forcefully. Also after the trauma of 9/11, Afghanistan is coming back into the comity of sporting nations is also a big news. But cricket has overshadowed everything,” he lamented. Most of the officials and sports persons squarely blame POA for not scheduling the event in consultation with the PCB. “The government has spent millions on creating the infra structure in Islamabad but here are hardly any sponsors, everything (money) has been sucked by cricket,” Mohd Kaleel, a former athlete said. But there are some who feel that cricket should not be blamed for the lackluster publicity the SAF Games are getting. “POA has to set its own house in order. Just imagine the main organising body of the Game is having election 18 days before the Games,” said the official. With hockey not included in the Games and India’s decision to send a junior football team, the interest in the Games has further eroded. Meanwhile, an era will come to an end in the POA today when Lieut-Gen Arif Hussain will takeover as its president. He replaces one of the oldest and life-member of International Olympic Committee (IOC) in Pakistan Wajid Ali Shah who ruled the POA with iron hand for last five decades. However, Wajid Ali Shah’s bid to install his son as president was foiled by his opponents who want to see last of that family. “Wajid has got his son in the IOC, what else he wants. How can we allow his son to replace him. It is not a dynasty rule in POA,” the official added. With just over 18 days left for the Games, there is hardly any mention of them either in print or electronic media. National champion Chetan Anand was shown the door by seventh seed Kenneth Jonassen of Denmark 4-15 5-15 while Nikhil Kanetkar went down against ninth seed Wei Ng of Hong Kong 7-15 2-15 late last night, according to information received here. Top rated Indian player, Abhinn Shyam Gupta was the only one who put up a brief fight in the second round encounter but eventually lost to third seed Chen Hong of China 8-15 5-15. Earlier, national women champion Aparna Popat bowed out in the first round itself losing to Yao Jie of Netherlands 7-11 9-11.